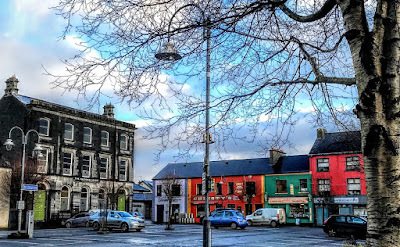 Listowel is first mentioned in the Plea Roll of 1303-1304 as Listokill, and the town of Listowel developed around the Castle and on the banks of the River Feale. But one of Listowel’s most distinguished features is the elegantly-proportioned market Square. The Square was first designed in the 1820s to the 1840s, and the current layout of the Square is similar to the Larkin map of 1810. It is reputed to be modelled on Covent Garden in London. This seems unlikely, though, for in the late 18th century Covent Garden was a well-known red-light district, attracting notable prostitutes, including Betty Careless and Jane Douglas. The main buildings on the Square include Listowel Castle and Saint John’s Church, the former Church of Ireland parish church, now Saint John’s Theatre and Arts Centre. Other landmark buildings on the Square include Saint Mary’s Roman Catholic Church, built in 1829, and the Listowel Arms Hotel, which I was writing about yesterday. The site of Saint John’s Church was presented to the community by Lord Listowel in 1814. It was designed as a Gothic-style church by the Limerick-based architect, John Pain, and local lore says the stones used to build Saint John’s were taken from the ruins of Listowel Castle. Saint John’s opened in 1819, but closed as a church in 1988. 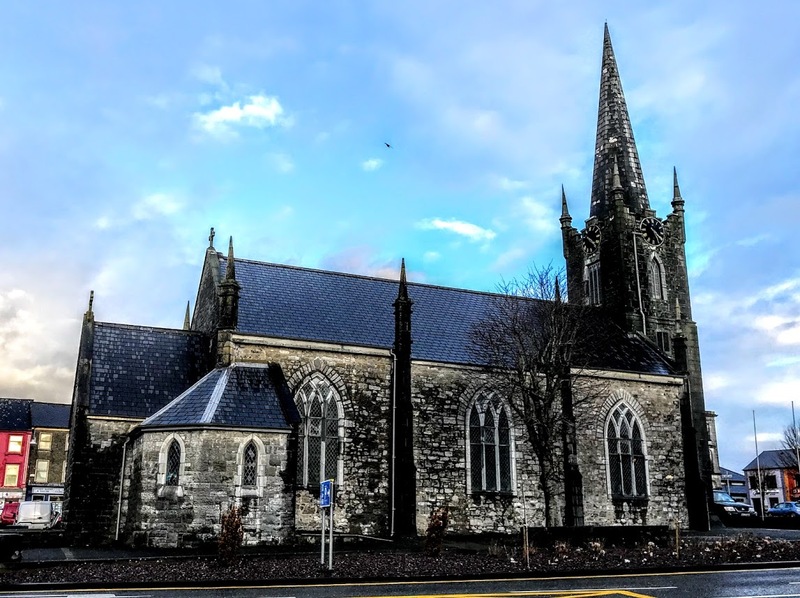 The Church of Ireland parishioners and the people of Listowel were anxious to preserve the building and make it a centre for local cultural activities and heritage, and it now houses a theatre and arts centre. The programme at Saint John’s includes theatre, music and dance, exhibitions, educational programmes and an annual summer school. The charm of the Square is enhanced by several elegant Georgian and Victorian shops, commercial premises and houses that line the street frontage. 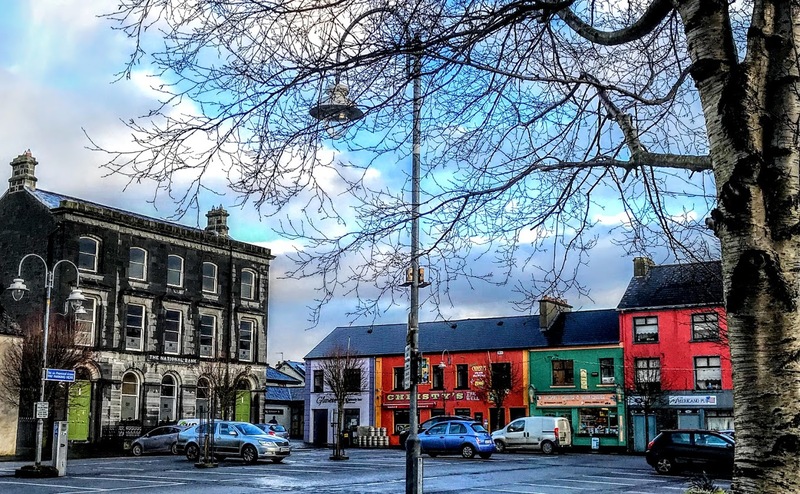 The 19th and 20th commercial buildings on the Square include three banks – the Bank of Ireland, Allied Irish Banks and the former National Bank – and the Castle Inn, beside Saint Mary’s Church and dating from the 1820s. A fine example of the commercial buildings on the Square is provided by the former National Bank, which was built around 1880 is now in offices. This is a detached, five-bay three-storey former bank, with single-bay three-storey advanced end bays. The round-headed ground floor windows have vermiculated keystones. The arched doorways have coved, rope-moulded reveals and the keystones have carved masks. Many of the Georgian and Victorian houses on the Square were the townhouses of local landed families. The residents of these houses over the past two centuries have included Bertha Beatty (nee Creagh), author of Kerry Memories, George Sandes (1821-1897), known as ‘the Terror of North Kerry,’ who lived at Bridge Road, at the side of the Square, and the O’Rahilly family of Celtic scholars and academics, including: Professor Thomas Francis O’Rahilly (1883-1953), a scholar of the Celtic languages; Monsignor Alfred O’Rahilly (1884-1969), President of University College Cork and TD for Cork City (1923-1924); and Dr Cecile O’Rahilly (1894-1980), best-known for her editions and translations of the epic saga Táin Bó Cúailnge. They were first cousins of Michael Joseph O’Rahilly (1875-1916) from Ballylongford, the only leader of the Easter Rising in 1916 to die in action. 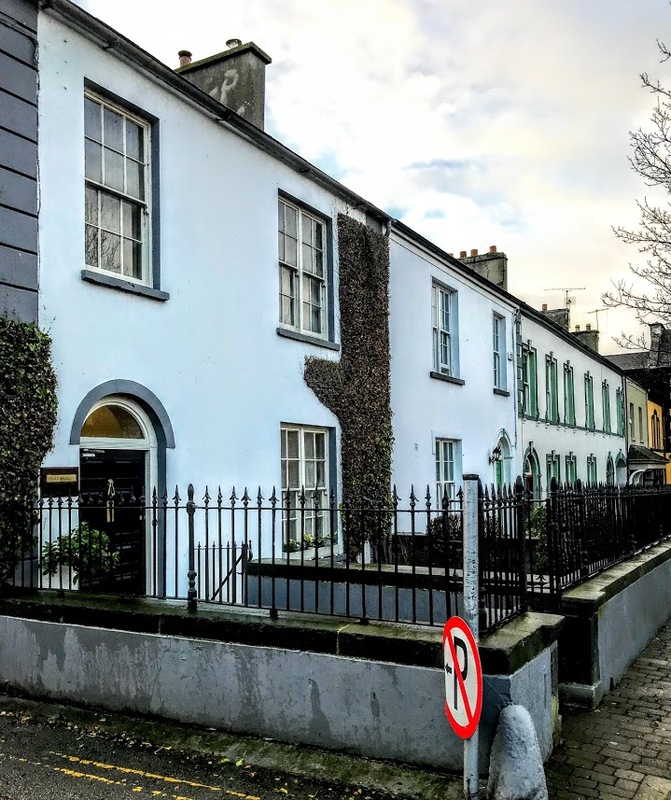 Nos 25 to 28 on the Square form an elegant terrace of Victorian houses between the castle grounds and the Listowel Arms Hotel. No 25 and 26 were built in the 1840s as a pair and have interesting round-headed doorcases. The other houses on the terrace were built three decades later in the 1870s. Bertha Beatty (nee Creagh), author of Kerry Memories, lived at Ivy House or No 24, a 19th century Georgian house beside Listowel Castle. The house, also known as Castle House, was built in the 1820s by a local solicitor, Richard Fitzgerald, who was the land agent of the Earls of Listowel. The house passed from Richard Fitzgerald’s widow, Elizabeth Agnes FitzGerald (nee Fitzmaurice) to her nephew, Dr Ulysses Fitzmaurice, in 1855. 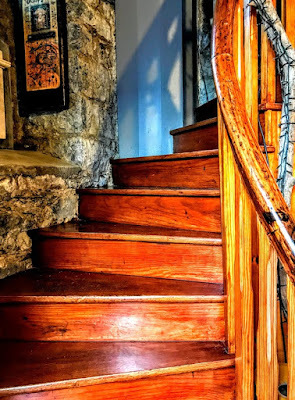 After the Fitzmaurices, the house was owned by the lawyer, Francis Creagh, father of the writer Bertha Beatty, and later it was owned by the O’Connor family. Today, it houses Seanchaí, the Kerry Literary and Cultural Centre, which opened in 2001. It includes an interactive audio-visual museum on the great writers of North Kerry: John B Keane, Bryan MacMahon, Brendan Kennelly, Maurice Walsh and George Fitzmaurice. A multi-purpose cultural centre behind the museum was built on the site of the stable attached to the house. This includes a performance area, book and craft shop, restaurant, archival library and reading area. Activities throughout the year include traditional music and singing sessions, visual art exhibitions, literary workshops, lectures and readings, and children’s activities.